The Nut Press celebrated its first Blogiversary today. On 6th October 2009, I wrote my first tentative post about Hilary Mantel’s Man Booker Prize win and ventured out into the blogosphere. Mighty Oaks from Little Acorns Grow. Each and every blog started with just one post and no followers. I didn’t worry about how much – or little! – content I had at the beginning. If you keep planting acorns, eventually you’ll get an oak wood. The same goes for blog followers. I don’t worry if my Networked Blogs or Google Connect widgets are looking empty or the few followers I have are rattling around in them. Not everyone follows a blog by signing up through either of those. Many people prefer to bookmark blogs and read them as and when they have time. Likewise, when it comes to commenting on blogs, not everyone wants to do this. Some people prefer to tweet you a response or mention it when you chat. Having a hard shell sometimes gives you a distinct advantage in life. Not everyone is going to like what I write or how I write on this blog. Which is fine. It’s probably a good job to get used to that because not everybody is going to like any book I get published either. The Nut Press changed its look a number of times but is now happy in its own shell. When I started blogging, I wanted to find a template that was easy to read (so as to showcase my writing), easy to navigate and to which I could easily add side-bar widgets and pages to the basic template. In short, one which had all the functionality I wanted. Considering the template I currently use is free, I’m very happy with everything the Comet theme from FrostPress gives me in this respect but we tried on a considerable number of outfits before we found each other. The Nut Press contains a different assortment of nuts to the one I ordered. I don’t blog about writing as much as I thought I would when starting out. I thought I’d journal my writing progress on my blog or post work-in-progress. I haven’t wanted to do that, so instead I’ve mainly blogged about events, reading, social networking or posted book reviews. It’ll be interesting to see whether or not that changes again over the course of the coming year. 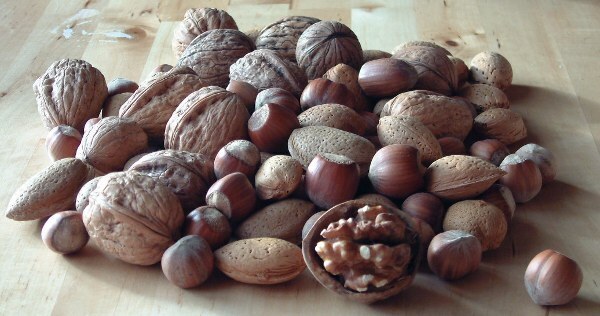 There are lots of different kinds of nuts. Instead of worrying about who’s reading this blog (from the outset, I always assumed only Squizzey and I did and I wasn’t so sure he bothered that often! ), I haven’t kept to a single niche or theme. I’ve simply blogged when I’ve had something to say, for example, because I’ve read a great book and wanted to share that or have been to a good event and that’s worked out pretty well. Different people respond to different posts, which is great. It’s always good when I get a comment because something I’ve said struck a chord. Some nuts aren’t really nuts. Just as a peanut is a legume, not a nut proper, I don’t think the odd post which might be considered off-topic for a blog that is mostly about books, reading and writing will put people off. Besides, it’s my blog and therefore up to me if I want to write about chocolate or life with a squirrel muse. A handful of nuts is better than eating the whole packet. I’ve read a lot of blog posts about “building an author platform”, telling me to blog regularly (at least 3-4 times a week). I understand the reasoning behind this but I’m not doing that at the moment. I don’t want blogging to become a chore. Nuts are even more delicious when mixed with other foods, like fruit and chocolate. I’ve had a lot of fun this year interacting with other bloggers, for example, by taking part in Book Blog Tours for Keris Stainton’s Della Says OMG!, Nicola Morgan’s Wasted and D.J. Kirkby’s Without Alice, visiting and reading other blogs and leaving comments and having people do the same here. It’s been fantastic to see how blogs and their bloggers can work together to help promote a book or an event, such as Talli Roland’s upcoming Blogsplash on 1st December. Watch this space! Some people have a nut allergy. There are some people who will never read my blog, even if I read theirs, comment regularly and retweet links to their latest blog post. I know I’m doing all of that for the right reasons, because their blog posts are worth reading, I like them and want to share them with others. I don’t do it to try and encourage reciprocal behaviour, so I have to accept it probably won’t happen in some cases, deal with it and move on. Nuts are a highly prized food and energy source. I’m amazed and thrilled that The Nut Press has been shortlisted for an award in the inaugural Wales Blog Awards 2010. When I started blogging a year ago, I never even considered I’d be on any kind of shortlist for it and I’m very excited about attending the Awards ceremony next week at Chapter Arts Centre and looking forward to meeting some more bloggers for the first time. Nuts are a healthy snack. If you’re shy (like me), blogging can be a great way to interact with other people without having to do it face-to-face. You write a post, people comment and you respond to those comments from the comfort of your own chair in front of the computer. Although, nuts are also great party food! I think I’ve mentioned already on The Nut Press how I’ve found blogging a great way of meeting people, both by visiting other blogs and having people visit mine, as well as through meeting bloggers at events out in the real world. To celebrate my first blogiversary and blogging in Wales, I’m hosting a Wales Blog Party this weekend (Friday 8th – Sunday 10th October inclusive). Drop in anytime over the weekend to see how it’s going and if you’re a blogger in Wales, I hope you’ll join in! Limbering up for NaNoWriMoLimbering up for N…Wales Blog Party!! !Wales Blog Party!!! oh you are so right about the whole nut allergy thing, that is a drole way of looking at it. Just trying to put a positive spin on things and not dwell on it. Thanks for the Blogiversary wishes and lovely to see you here! So if I eat lots of nuts will I get a harder shell? And I like blogs that don’t post too many times a week because it makes it difficult for me to keep up with their blog. This is a great post Kath. It’s worth a try, Sarah, although I’m not sure it works like that. Still, at least nuts are a healthy snack! Lovely to see you over here at The Nut Press and thanks for reading and commenting.